Jason just blogged his take on an official definition of "Web 3.0" -- in his case he defines it as better content, built using Web 2.0 technologies. There have been numerous responses already, but since I am one of the primary co-authors of the Wikipedia page on the term Web 3.0, I thought I should throw my hat in the ring here. Web 3.0, in my opinion is best defined as the third-decade of the Web (2009 - 2019), during which time several key technologies will become widely used. Chief among them will be RDF and the technologies of the emerging Semantic Web. While Web 3.0 is not synonymous with the Semantic Web (there will be several other important technology shifts in that period), it will be largely characterized by semantics in general. Web 3.0 is an era in which we will upgrade the back-end of the Web, after a decade of focus on the front-end (Web 2.0 has mainly been about AJAX, tagging, and other front-end user-experience innovations.) Web 3.0 is already starting to emerge in startups such as my own Radar Networks (our product is Twine) but will really become mainstream around 2009. Why is defining Web 3.0 as a decade of time better than just about any other possible definition of the term? Well for one thing, it's a definition that can't easily be co-opted by any company or individual around some technology or product. It's also a completely unambiguous definition -- it refers to a particular time period and everything that happens in Web technology and business during that period. This would end the debate about what the term means and move it to something more useful to discuss: What technologies and trends will actually become important in the coming decade of the Web? Still a great vision for the wired world. the webos will come faster than we think. Before we get to web 3.0, I think we need to figure out web 2.0. Web 1.0 took us years to realize that Brick and Mortar was the solution. Now web 2.0 is here and we are learning how our customers can help improve our businesses online. On my blog, www.sheeleytech.com,I write about the idea of Web2.0 and Mortar. Tim -- I would actually say that I agree with much of what you state above. EXCEPT for one thing. The Semantic Web is completely orthogonal to the issue of collective intelligence. It can in fact be used as a better backend for existing "Web 2.0" folksonomies, or it could be used for expert systems. It would not be technically correct to say that Semantic Web is not about statistics or about deriving structure from what is already there in the data -- The Semantic Web is just a way of encoding whatever it is that you know (it could have been derived, or not). So you could use statistics, or mining, or the wisdom of crowds, to markup data -- but then where do you store and share what you have learned about that data? The Semantic Web proposes a richer framework for storing and publishing that metadata. It is completely independent of how the metadata is generated. Using string tags and microformats, or XML tags for that mater, are just different ways of marking up data. RDF and OWL are also just different ways of marking up data -- but they are BETTER ways of doing it. They have much more power, they are more open, they are more extensible, they support bottom-up collective intelligence better in fact. Alas, I find the Web 3.0 arguments as clear evidence that the proponents don't understand Web 2.0 at all. Web 2.0 is not about front end technologies. It's precisely about back-end, and it's about meaning and intelligence in the back end. The real difference between Web 2.0 and the semantic web is that the Semantic Web seems to think we need to add new kinds of markup to data in order to make it more meaningful to computers, while Web 2.0 seeks to identify areas where the meaning is already encoded, albeit in hidden ways. E.g. Google found meaning in link structure (a natural RDF triple); Wesabe is finding it in spending patterns. There are sites (geni.com comes to mind) that create narrow-purpose cases where people add structured meaning, and I think we'll find lots more of these. But I think that the big difference is in the amount of noise you accept in your meaningful data, and whether you think grammar evolves from data or is imposed upon it. Web 2.0 applications are fundamentally statistical in nature, collective intelligence as derived from lots and lots of input at global scale. See my various posts on Web 2.0 vs. the Semantic Web. Meanwhile, Web 2.0 was a pretty crappy name for what's happening (Microsoft's name, Live Software, is probably the best description of what's happening), so I don't see why we'd want to increment it to Web 3.0. 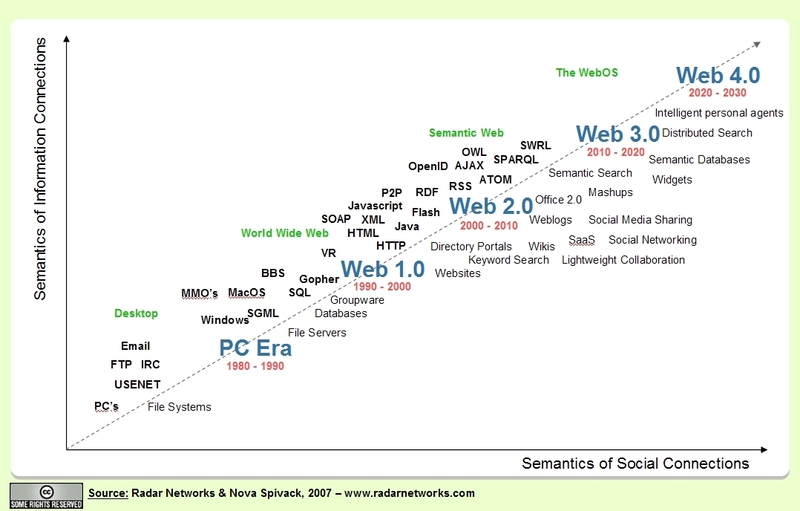 But when people ask me what I think Web 3.0 will be, I don't think of the semantic web at all. What are things that will give a qualitative leap beyond what we experience today? I think it's the breaking of the keyboard/screen paradigm, and the world in which collective intelligence emerges not from people typing on keyboards but from the instrumentation of our activities. In this sense, I'd say that Wesabe and Mint, which turn our credit card into a sensor telling us about tracks we're leaving in the real world, or Jaiku, which turns our phone into a sensor for a smart address book, or Norwich Union's "Pay as you drive" insurance, are more early signals of something I'd call "Web 3.0" than Semantic Web applications are. Web 1.0 One-Dimensional - Google search results that are linear. Web 2.0 Two-Dimensional - Image Maps www.KartOO.com.